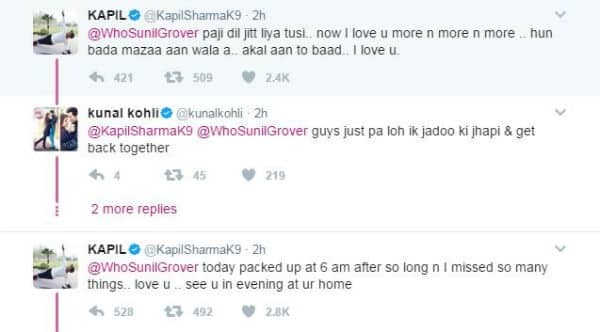 Kapil Sharma and Sunil Grover’s exchange on Twitter is highly AWKWARD! The fight just got uglier. While up till now, Kapil Sharma was making his fans believe that he and Sunil Grover haven’t fallen out and that it was just a ‘healthy fight’. Sunil Grover has now exposed Kapil Sharma’s reality by not only accusing him of ‘ill treating’ him but also dropping hints on quitting The Kapil Sharma Show. Yes, Sunil in his recent tweet finally broke his silence on being badly hurt by Kapil. He wrote, “Refrain from using foul language in front of women who had nothing to do with the stardom you carry, they are by chance just traveling with you. Thanks for making me realise it was your show and you have power to throw out anybody, anytime. You are the wittiest, and the best in your field. But don’t act like a ‘God’.” Clearly, major differences have crept in between the two. But you know what’s worse? Now it’s left to see if Kapil actually manages to meet Sunil and convince him to get back on his show. Do you think Kapil and Sunil will bury the hatchet or is it the end of their partnership once and for all? You can drop your thoughts in the comments below as we’ll be back with more updates on this hot story, right here only on BollywoodLife. Next articleSalman Khan and Katrina Kaif’s first look pictures from Tiger Zinda Hai are here and we cannot keep calm!